Hello friends! 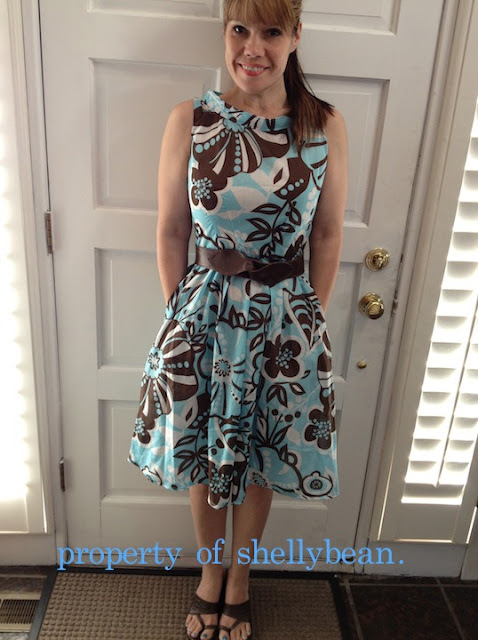 Here is a review for a dress I made earlier this summer. I love the dress because it's made from a super light cotton gauze, but isn't see-thru. This is perfect for all of the super hot days we've been having. Simplicity patterns joined with Project Runway to make the pattern. What I alike about these types of patterns is that they give you options on sleeve length, collar type, belts, and lengths. By this, you get at least five different dresses to make. They seem versatile enough to make from different fabrics, thus having dresses I can make for every season. That works for me. I really did intend to have this dress have sleeves....but I messed them up royally. I think I hemmed the wrong end and then tried to attach them backwards. Ridiculous. I'm glad I was able to convert the dress to sleeveless.....cause you KNOW I'm going to wear a cardigan with it anyway. 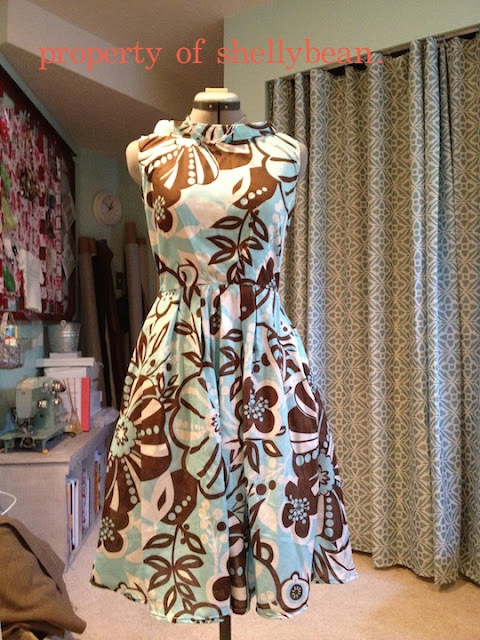 Pattern Description: This pattern is a multi-choice dress inspired by Project Runway. The dress has a choice of neckline- scoop, standing or cape. The sleeves can be short, three quarter length or sleeveless. 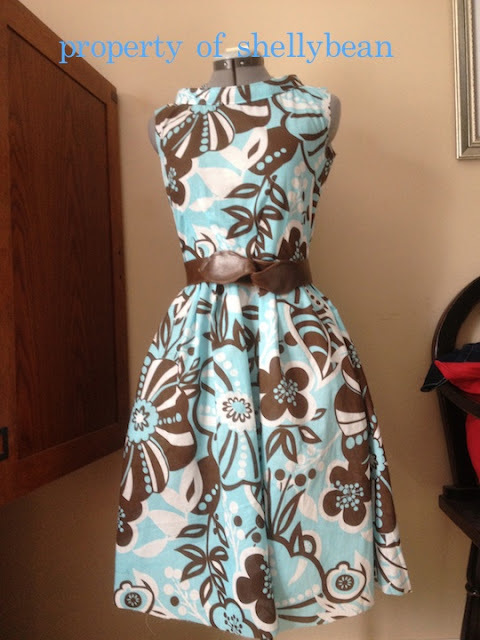 Each dress can be made with or without a sash and have the option to add a store-bought belt. The bodice has angled darts that meet the pleats in the skirt. The dress falls right at the knee. It also has pockets! Pattern Sizing:The pattern I bought was size D5 It comes with 4,6,8,10, 12 European sizing 30-38, French 32-40. 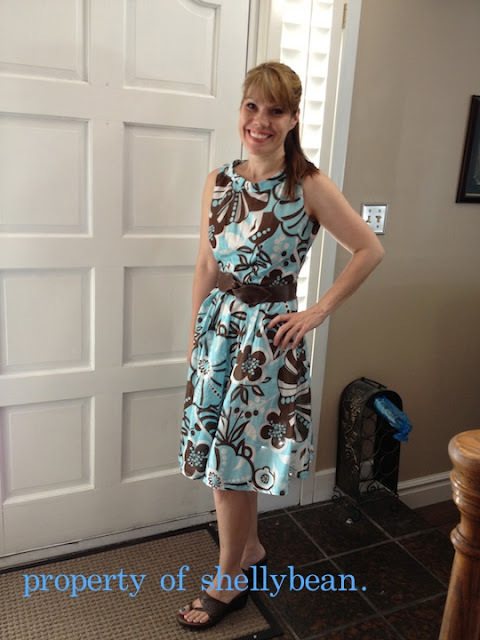 I'm a RTW 4, so I went with a size 10 and didn't grade because the skirt was full, and the dress had a belt. I decided to go with the dress with a store bought belt, standing collar and sleeveless style. Did it look like the photo/drawing on the pattern envelope once you were done sewing with it? Yes. I originally cut the dress to have short sleeves, but for some reason, I had the worst time attaching them. I think I may have hemmed the wrong end...I will have to mark better next time. Were the instructions easy to follow? The instructions were very simple to follow. The dress came together easily. What did you particularly like or dislike about the pattern? I loved that the darts in the bodice matched up so well with the pleats in the dress. It fits very well and having pockets on any girly-dress is a plus. I didn't like the fact that I struggled so hard with the sleeves. This has been an ongoing problem with me, so I'll just have to keep trying at that! Fabric Used: I used a beautiful beach-y cotton gauze. The pattern is bright, but the fabric is light enough for the hottest days of summer. We sure have had our share of those! 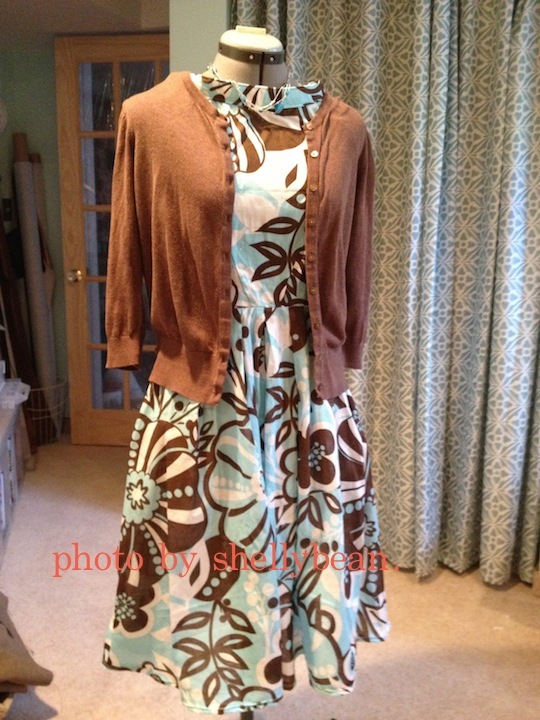 Pattern alterations or any design changes you made: I had to change the sleeves to the sleeveless style. It was my fault and it will be fine since I'll wear a cardigan with it anyway :)I also had to cut off an inch from the length. Conclusion:This is a flattering dress that has a bit of a retro feel. I love that there are so many options to this dress. I can easily see making one for each season, and again, the pockets are fantastic! Pattern 2444 with Pockets!! Woo Hoo! Happy Last Days of Summer, friends!! Wow, beautiful. The belt you bought is perfect, it compliments the dress so well. Best of all you look so happy in it! It looks wonderful! I like it without the sleeves and like the retro look. You made it your own. Can't wait to see your next creation! Absolutely with an "M" on it! Or a "B" for my favorite librarian. You make me smile every time you leave a comment. Thanks for that. Beautiful dress (as always). You did a great job and look amazing in it. Well done! Bad time for me to not have a page, eh? Thank you, Missy! I had that fabric on hand forever..I can't even remember where it came from. The neckline was my favorite part of the dress...that, and the pockets. I'd love to see what you come up with from the pattern. Link it to me! Wonderful job!! You look great in it as well!!! Lovely dress and that fabric is so adorable. Thanks, Sassy. I was glad to find a use for the fabric! I had juussst enough! Thank you, sweet friend. THanks also for sharing the love on FB. Parts of me wish I were still on. I would have loved to "like" all those nice comments. Love you AND the word, "smashing"! Gorgeous dress! I really like the placement of the pattern on the front bodice, with the large flower at the right shoulder. Who needs sleeves anyway? This is super-cute! Thanks for noticing the fabric placement, Bex! Unfortunately, I didn't have enough to do that on the back...That's my story and I'm sticking to it! Who needs sleeves? I think I love you! Wow - this is really pretty and I love your choic of fabric. This blog post was featured on Simplicity’s Facebook page. I will include the link to the page so you can have a look. Please invite your followers to see your post on our page. I hope you continue doing wonderful work and include simplicity into your designs. Oh my! This dress is gorgeous and it looks gorgeous on you! Great job! Welcome, Judith and thank you! I hope you find something you like! This pattern is on my 'to purchase' list, so I am peeking around for other's experience with it. Thank you for your review and pics. Such a Gorgeous result!! You did a fantastic job and used beautiful material (gives me the courage to choose the larger size pattern on a fabric!!). Loving the retro style! Two awards and a crossroad..